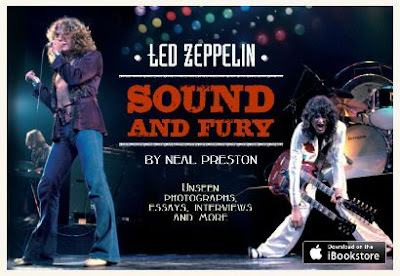 “Led Zeppelin: Sound and Fury”, a new digital book by photographer Neal Preston, will be published on April 15. The in-depth, illustrated digital coffee-table book is created and designed especially for iBooks, providing an unprecedented and comprehensive glimpse into the world of Led Zeppelin through the lens of the famed photographer. Blending images, interviews, and information to allow readers inside access into some of the greatest moments in rock history, “Sound and Fury” features hundreds of photos of the band from throughout their career (including over 100 that have never been seen before), audio introductions, written pieces, hi-definition video interviews, ephemera, commentary from contemporary artists, technical camera info, band discography, and more.